At the very beginning of 2013, I started investing in Bitcoin . My approach to accumulation is Dollar Cost Averaging ( DCA ). I am a very big believer in the mental aspect of accumulation. This means that if I am utilizing DCA because I am extremely long on Bitcoin , I would like to DCA when the price is down - at least for the short term. It is the essence of "Buy The Dip". It does create great trading potential, however, I do not Buy The Dip because I want to trade. Lastly - which some disagree with - is the historical data that we have on Bitcoin in terms of the flow and movements of BTC . For the purpose of transparency, throughout the year I did not think that BTC would break below $5k. This is also why I mentioned on videos throughout the year that $3,500 - $5,500 area is an extremely great price to accumulate in my opinion. The purpose of explaining all of this is because it is the foundation of what you see on the screen. Halving - The amount of brand new mined BTC is cut in half for miners. Also, the price earned for mining 1 BTC is also cut in half. After ATH is reached, you see consolidation and sell-off in BTC price. This is the correction phase. Each cycle is highlighted on the chart. Both past and SPECULATIVE present. You will see a steady decrease in % gains in each cycle. This is normal. Important to note: You will also see the key area of .786 on the Fibonacci retracement (red lines) plays a crucial role in defining the bottom range. My other Steemit articles on 3commas the software I use to build my crypto accounts, I share how to use this powerful tech, and strategies and configurations I personally use. Great post this is the second chart I’m seeing with the same trajectory. I believe were in accumulation period right now with a market reversal coming soon after the longest bear market in bitcoin’s history. Im BTC long too definitely but I would look to take allot of profits around the 75,000 levels and sell it all once market reversal is confirmed and wait to buy back in again. I hodled through the last bull market all the way till now. I learned my lesson. I was completely new thought we were going to a million without understanding markets then. Ive learned allot since then. I really appreciate it! 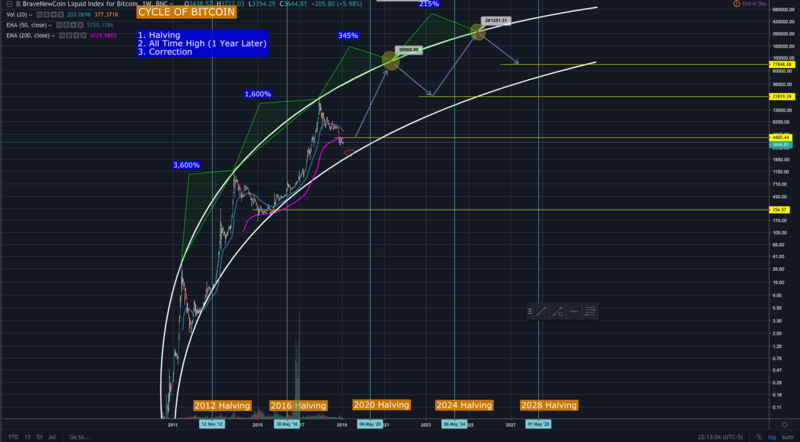 Based on these technicals and all past BTC data ( and assuming this pattern repeats again as it has 4-5 times already), my estimate is the market will pump to roughly 90,000 by April or May 2020 but definitely within this estimate, there is a margin of error, I'm looking between 70k to 100k. From there expect pull back to 20kish march/april 2023. Then Pump to 280K by june 2025. Yeah ima give it an in depth look on tradingview but I like your estimates and I expect the same. Nows the time to cost avg and accumulate again. Wish I had known market cycles in the beginning but Ive learned from my mistakes. Crypto is basically the first asset class I’ve really invested in. I went from 12x my investment to down 80% on my initial investment. SMH I bought more when I should of sold. This post has received a 32.14 % upvote from @boomerang. Is the market going to crash because that's all I'm hearing?? You got a 98.75% upvote from @minnowvotes courtesy of @the.success.club! Hope that makes more sense. Let me know if you have any questions, or see anything I missed in my analysis. Really Adore the work you are doing with the posts for the community over here. Also Bitcoin's Techtonic shift from the highs of $15000+ to Sub $5000 levels are more of a vested interest in trading such a high currency any way. Binance showed a sudden drop of almost around 60% in the trader when the BTC rose to $15K - $20K. Its also a matter of supply and demand! More supply lesser the demand! I've followed you and would be really happy if you can guide me here. Could you please have a look at the video and give me feedback and how I can improve my work and help the community here? Really appreciate the thoughtful comment! I'll check it out and I'll get right back to you! This chart is our road map for the next 10 years. Just love it. Thanks for sharing! Thank you for your post @the.success.club. is this time is suitable time to buy bitcoin for invest? or falling more bitcoin price?